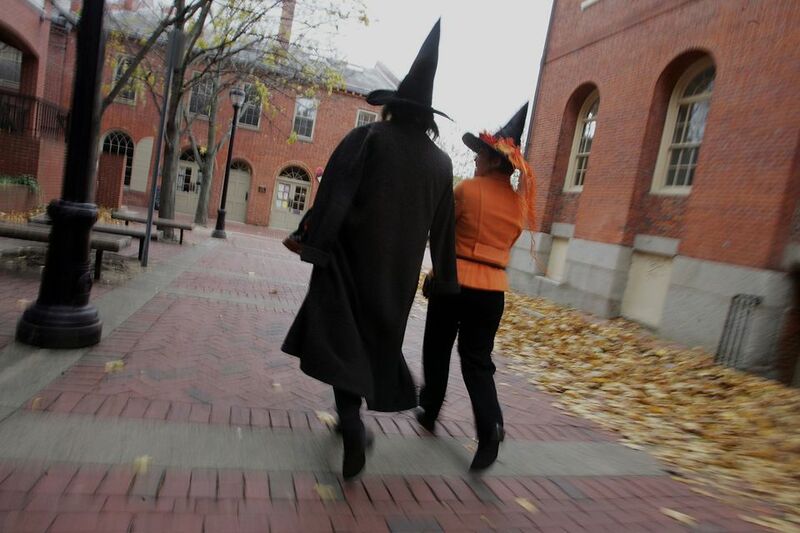 Is there any spookier place in America than Salem, Massachusetts, forever branded by the hysteria in 1692 that led to accusations of witchcraft? And yet visitors are drawn to the town. Maybe it's the salt air of the sea and the lingering specters of sailors and pirates. Maybe it's Salem's association with Nathaniel Hawthorne, whose writings sometimes revealed his own tortured wrestling with an ancestors' involvement in the witch condemnations. If you're looking for a spooky spot for a getaway this October or any time of the year, Salem can't be beat. It's a walkable city with so much history and so many things to do. October is a particularly good time to visit Salem. In addition to the town's normal host of bewitching attractions, you'll find a full calendar of haunted happenings that range from a seance to a costume ball to ghostly guided walking tours. And there's nothing quite like being in Salem on Halloween. Year-round, Salem takes advantage of its wicked past, serving up a variety of attractions that retell the history for which the town is best known. In addition, you'll find other great spots to visit that commemorate Salem's seafaring history and literary connections. Start your Salem adventure at the National Park Service's Salem Visitor Center. From there, it's easy to follow the Heritage Trail, much like Boston's Freedom Trail, a red line that takes you through town and past many of Salem's most popular attractions. Close by, you'll find the Peabody Essex Museum, founded in 1799 and home to art and history collections. The Phillips Library on the museum's campus is a repository for the original court documents from the witchcraft trials. Move on to the Salem Witch Museum for a compelling retelling of the accusations, hysteria, trials, and executions of 1692 through life-size dioramas. This might be a bit frightening for younger children but serves as a terrific introduction to Salem's blemished history. If you've not yet had your fill of witchy stuff, include the Witch Dungeon Museum on your tour, too. There, actors re-create the witch trials based on the 1692 transcripts. The witch stuff is fascinating, but it's time to transition to some of Salem's other attractions. Get weaned off witches and onto Salem's sea-shaped past at the Salem Wax Museum of Witches & Seafarers. Meet many of the characters from Salem's past, realistically re-created in wax, and participate in hands-on activities such as gravestone rubbing. A discounted Wicked Special Deal available during the Halloween season provides admission to the wax museum, Frankenstein's Castle, a spellcasting, and the Haunted Witch Village. The New England Pirate Museum has a fascinating collection of memorabilia from the days when notorious sea-robbers like Blackbeard and Captain Kidd terrorized the waters off Boston's North Shore. Meet the famous rapscallions and hunt for hidden treasure. Also, make a stop at the Salem Maritime National Historic Site. The waterfront site includes three wharves, the U.S. Custom House complex (where Nathaniel Hawthorne opens his novel, "The Scarlet Letter"), the Derby House, the Narbonne House and the West India Goods Store, plus the tall ship Friendship of Salem. View free movies detailing Salem's maritime past and take a guided tour of the complex. Don't miss the House of Seven Gables. Immortalized by Hawthorne, the House of Seven Gables is one of the oldest surviving 17th-century wooden mansions in New England. If you're searching for spookiness, you'll love the home's secret staircase and ghost story. The house in which Hawthorne was born is also located at the site, which is open for tours most days of the year. Other attractions you might find of interest include the Salem 1630 Pioneer Village; The Phillips House, a federal mansion filled with artifacts; Pickering House, the oldest house continuously occupied by the same family; The Witch House, former home of witch trials judge Jonathan Corwin; and The Old Burying Point, Salem's oldest cemetery, which contains the graves of a Mayflower pilgrim and witchcraft trial judge John Hathorne, ancestor of Nathaniel Hawthorne. Spirits of the Gables: From Oct. 5 to 27, 2018, tour the House of Seven Gables and meet characters from Hawthorne's famous novel. The Hawthorne Hotel: The Hawthorne Hotel will host its annual adults-only Halloween party on Oct. 27, 2018, complete with costume contest. The theme for 2018 is Happily Never After. Messages From the Spirit World: Salem's only authentic seance will be held nightly in October at the Spirit Parlor of OMEN. Spirit mediums will conduct these evenings of conversing with the dead. The Official Salem Witches' Halloween Ball: The annual Official Salem Witches' Halloween Ball, an evening of reveling and cavorting with the spirit world, takes place Friday, Oct. 26, 2018, at the Hawthorne Hotel in the heart of historic Salem. Haunted Harbor Cruises: Mahi Mahi Harbor Cruises & Events will take you on a spine-tingling 75-minute voyage filled with spooky stories set in Salem Sound and along the New England coast. There are a full bar and grill on board, and activities for kids and adults include Tarot card reading and face painting. Haunted Harbor Cruises depart from Pickering Wharf daily throughout October. Tales and Ales: Sample three local ales, then settle in for a spine-tingling hour with Sir Arthur Hennessey spinning terrifying tales at Salem's Gallows Hill Museum and Theatre on Oct. 5, 6, 11, 12, 13, 18, 19, 20, 25, 26, and 27. Where to stay: The Hawthorne Hotel is centrally located and one of the most popular lodging options for visitors to Salem. If you'll be visiting Salem with kids, the family-friendly and conveniently located Salem Waterfront Hotel & Suites is a good choice. Other places to stay in Salem include the Amelia Payson House, a restored Greek Revival bed-and-breakfast; the Coach House Inn, an 1879 Victorian sea captain's mansion with antique decor; The Salem Inn, which includes three historic buildings listed on the National Register of Historic Places; and the Stepping Stone Inn, built in 1846 for a naval officer and located in the heart of historic Salem. Where to eat: If you want to consume a prime rib that you'll remember for years to come, include a stop at Victoria Station. The restaurant is at Pickering Wharf and overlooks Salem Harbor. The salad bar at Victoria Station is something to rave about, too. For an eclectic menu of pub favorites and locally made brews, head to Salem Beer Works, where there is always something new on tap.